HDL-2–mediated mass cholesterol efflux from macrophages. Mouse peritoneal macrophages (MPMs) or THP-1 cells were incubated for 24 hours in DMEM containing AcLDL (50 μg protein/ml) with T0 (3 μM), then cholesterol efflux was performed for 8 hours with HDL (50 μg/ml HDL protein) added to media. (A) HDL-2–mediated cholesterol efflux from MPMs. The data show the increase in TC, FC, and CE mass in media and represent mean ± SEM of 9 independent experiments. *P < 0.01, #P < 0.05 versus control HDL-2. (B) Cholesterol removal from MPMs by HDL-2. The data show the mass of cholesterol remaining in cells at the end of the efflux period and represent mean ± SEM of values from 9 independent experiments. *P < 0.01, #P < 0.05 versus no addition of HDL-2; †P < 0.05 versus control HDL-2. 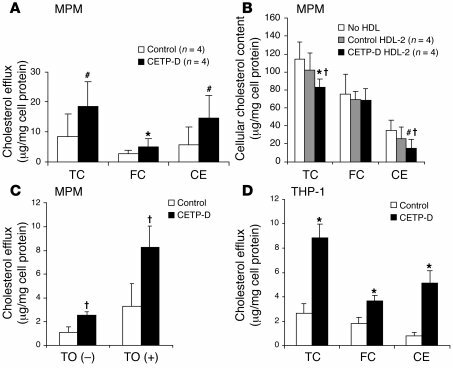 (C) HDL-2–mediated cholesterol efflux from MPMs treated with or without T0. The data show the increase in TC mass in media and represent mean ± SD of an experiment performed in triplicate. *P < 0.05, versus control HDL-2. (D) HDL-2–mediated cholesterol efflux from THP-1 macrophages. The data represent mean ± SD of an experiment performed in triplicate. *P < 0.01, versus control HDL-2.